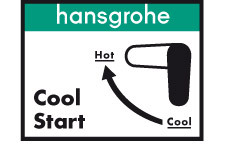 Hansgrohe's CoolStart technology means that only cold water will flow out when set to the middle position. Whereas in standard mixers the continuous flow heaters or circulation pump start up immediately when in the middle position, in CoolStart mixers the piping system does not fill up unnecessarily with hot water. When you move the lever to the left, hot water is added. The user decides how high the temperature needs to be. It is not possible to move the lever to the right. To sum up: CoolStart reduces energy consumption, and therefore CO2 emissions too. This means that Hansgrohe's latest technology automatically reduces the burden on both the environment and your wallet. The innovative operating concept (the lever for the hot water can only be moved to the left) marks a new trend in the sanitation industry. Hansgrohe is launching the CoolStart technology in its popular Metris, Talis and Logis mixer ranges. Its top selling point is its savings potential. Anyone purchasing mixers with CoolStart will save energy, and therefore money too. And in conjunction with EcoSmart, your customers can save precious water – up to 60 percent in fact. From individual purchasers to hotels: the CoolStart range is of interest to a broad target group and offers you excellent sales opportunities in the project business. The successful Metris, Talis and Focus ranges, which are well-established in the market, will ensure that CoolStart receives a high profile – and in different price ranges too.